Follow this link to read about our appeal, and watch the video. Did you know that about 3,000 people came through the Mount St Helens Creation Center last year? Many of these were like Jon. He was having his 11thbirthday in this area. He had learned about Mount St Helens from anaudio series, and wanted all his family to know how the volcano illustrates the truth of God’s word. Many of them were like Roger, who, though he didn’t believe in the timescale of Genesis, wanted to accompany his nephews and nieces to the area, with his sister and brother-in-law. After walking th eHummocks Trail with us, he was convinced that the Bible’s timescale was true. At Mount St Helens, people see for themselves the results of natural catastrophe, and at the Mount St Helens Creation Center, we are here to help them make the connection between this and the worldwide catastrophe of Noah’s Flood. It is only at the Mount St Helens Creation Center, that visitors to this area will get a biblical and scientific view of the events that have shaped this landscape. Our new Center is in an exciting location, in the heart of downtown Castle Rock—a small city, situated right by the Interstate, at the point where visitors exit to drive to the mountain. We want even more people to be able to see even more exciting, faith-building displays and information, which will point them to the truth of God’s word. That is why we are asking to you to partner with us, to raise $40,000 in 2017. In this first phase of the development of the Center, we will use this $40,000 to go towards things like information displays, and painting and decorating the facilities, as well as carrying out essential repairs. We want thereto be a friendly, attractive, and dynamic environment here, in which the truth of God’s word will be proclaimed. In three phases, we are asking you to help us achieve our goal of $100,000. All mail should be directed to this address in future. Whether Genesis is actual history or not is of crucial importance to Christians today. The historicity of Genesis is under attack as never before, particularly in seminaries formerly considered to be conservative evangelical. Pastors are often teaching either that Genesis is to be interpreted, in accordance with deep time views, or that its interpretation does not matter to Christian theology. It will surprise nobody that the Mount St Helens Creation Center rejects both these compromise positions, and argues strongly for Genesis not to be interpreted at all, but to be read as it appears—as literal historical narrative. So this ministry welcomes a remarkable new film; Is Genesis History? The film is the brainchild of Dr Del Tackett, and is filmed in 4K. Dr Tackett has visited a large number of places associated with deep-time geology, and shown them to be better interpreted within a biblical framework. His film includes interviews with a large variety of scholars and scientists, who hold to biblical principles and opinions. The film will be seen at its best in a one-night-only screening, in a variety of movie theaters around the country. I will be attending one of these screenings – probably in Olympia, WA. I urge you all to consider getting a ticket for the movie, and watching it. The tickets can be purchased through the Is Genesis History website – isgenesishistory.com. Although I expect the movie will be available in a variety of formats later, the full 4K effect will be best seen in a movie theater. Please note that, although this ministry supports this movie, we are not part of the production, and will not gain financially from it. However, we would like YOU to gain from it. For that reason, we are offering our book “The Biblical Age of the Earth” for the special event rate of $4 (normally $6.50). In addition, you can have the book sent via free shipping! Simply purchase the book, applying first the coupon code “isgenesishistory” (without the quote marks, and with no spaces), and make sure you select the “free shipping” option that will appear, after the coupon is applied. This special offer, to celebrate the launch of Is Genesis History will end on Friday February 24th 2017. It is disappointing when a well-known speaker uses a sermon to cast doubt on the authenticity of the Bible. That is what happened recently, when Andy Stanley, senior pastor of North Point Church, preached a series of sermons on what he referred to as apologetics. Of course, Stanley denies that he is undermining people’s belief in the Bible. His purpose, he says, is to talk to those who have given up on Christianity, and show them that they have thrown out the baby with the bathwater. This is an honorable aim. But, in the view of this writer, he has not achieved it. In one of his talks he refers to a “Bible tells me so” religion as a sort of “house of cards”. This, says Stanley, is where we believe something simply because the Bible says so. The reason why he says this is problematic is because, he claims, it causes problems for our young people. These young Christians have been told to believe the Bible, but then get to college and find out that the walls of Jericho did not fall down, and that the universe was not made in 6 days, but started 14.7 billion years ago in the Big Bang. Stanley claims that a Christians foundation should be in the truth of the Resurrection, rather than the truth of the Bible. There is an obvious problem with his statement. Where do we find out about the resurrection? We learn about it from the Gospels, which are in the Bible. We learn about the theological importance of the Resurrection from 1 Corinthians 15 – again, this is in the Bible. So, in order to put our trust in the Resurrection, we have to start by believing the Bible is true. Stanley, at one point, claimed that early Christians did not accept the teaching about the Resurrection because it was inspired, but because it was true. He, therefore, affirms the truth of what is written in the Bible, but not the inspiration. This, however, is a problematic position. He has to rely on his version of church history, in order to maintain the truth of the biblical accounts. But this is putting the proverbial cart before the horse. His reason for accepting the truth of the Resurrection accounts is actually personal and subjective, because he is relying on an individual’s rationality, to make a judgment on the truthfulness, or otherwise, of a biblical account. This is the wrong way around. Our position is that we accept the truthfulness of the accounts of the Resurrection BECAUSE they are in the Bible, which is the inspired word of God. His comments about the origin of the universe are the giveaway. Stanley has shown that he will judge the truthfulness of the Bible, by reference to external standards, such as the Big Bang theory. The opposite angle would be the correct methodology – that is, we should judge the truthfulness or otherwise of cultural concepts, such as the Big Bang, by whether or not they agree with the biblical account. One aspect of Stanley’s criticism is justified. Simply repeating “the Bible says so” as a mantra is insufficient. It is legitimate to delve further and ask why the Bible says something, or research the corollary of the truthfulness of a particular account. But at no point should such research place a higher authority on external standards than that of biblical truth. God’s word does not require our authentication. We require its authentication for our opinions. After our most successful season ever, in 2016, we are looking to the future of the Mount St Helens Creation Center. In 2017, we need to find permanent new premises for the ministry, if possible. With that in mind, we know that the building we are looking at needs refurbishment – painting and decorating. We also need to design, create, and install new displays for our Center, and have roadsigns posted at I-5 exit 49, to bring people to the Center. All these things cost money. So we are asking that you would consider making a donation to our Christmas Appeal 2016. You can find the full details of our appeal, watch a video, and find out the benefits, by visiting our special FaithLauncher page. Decoration of our hoped-for new premises. A new venture: the Mountain Word Academy, training in apologetics and general education. Our friends at Answers in Genesis have built a full-size replica of the Ark. This magnificent construction, in Kentucky, is witness to God&apos;s grace and His work of salvation. This is how their Ark Encounter website describes the project. The full-size Ark will house a wonderful, God-honoring and faith-building exhibition about the Flood. We commend AiG Ken Ham, and all his colleagues, on this achievement, and pray that it will be mightily used of God to bring people to salvation in Jesus Christ. The opening date for this project is Thursday July 7th 2016. 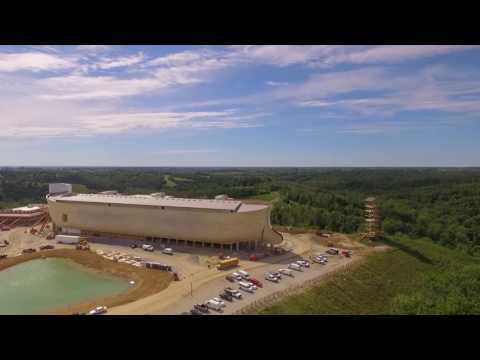 For more information, please see their special Ark Encounter website. Meanwhile, the link below opens up their latest drone footage of the project. The Mount St Helens Creation Center will be closed from Friday June 24th through Monday June 27th 2016, as the Silver Lake Grange is being used for the Arts on the Mountain event. Make sure you visit Arts on the Mountain! Also, visit our booth on Saturday June 25th at the Oregon Home Education Network Convention. Today, May 18th 2016, is the 36th anniversary of the eruption of Mount St Helens. Isn’t it time that you came to view the area around the volcano? And when you do, no visit would be complete without stopping at the Mount St Helens Creation Center. It is only at our Center that you will hear about the biblical context of the eruption, including how so many things that happened were reminiscent of the events of the worldwide flood of Genesis 6 through 9. Many people have wanted a guidebook, or tourist guide, of the area, written from this biblical context. Well now you have one! Within the next 2 weeks, we will take delivery of our new little tourist book, The Road to Mount St Helens. This book will help you with your own excursion on the popular West Side of the volcano. We are very grateful to the members of Silver Lake Grange (#105) for their permission and support, in allowing us to “set up shop” for 2016 at the Silver Lake Grange. We have put together the bookstore, the displays and the presentation area. We have already had several visitors, who have seen our signs and flags on the highway. Please remember to come and visit us at our temporary new location! Episode 7 of The Mountain And The Word contains the news about the new premises for the Mount St Helens Creation Center. Then, in a third show about apologetics, with information from his book “Only Believe”, Paul looks at Proverbs 9:10 on the “beginning of wisdom”.